FILE: FBI Director Christopher Wray waits to testify before a House Judiciary Committee hearing on Capitol Hill in Washington, U.S., June 28, 2018. FBI Director Christopher Wray made clear that U.S. law enforcement doesn’t support a proposal by Russian President Vladimir Putin to have American investigators go to Russia to observe interviews of suspects wanted by the U.S.
[post_ads]“I never want to say never, but it’s certainly not high on our list of investigative techniques," Wray said wryly at the Aspen Security Forum in Colorado on Wednesday. Wray also dismissed the other side of Putin’s proposed deal: to let Russian investigators come to the U.S. to observe questioning of suspects that they’re interested in. 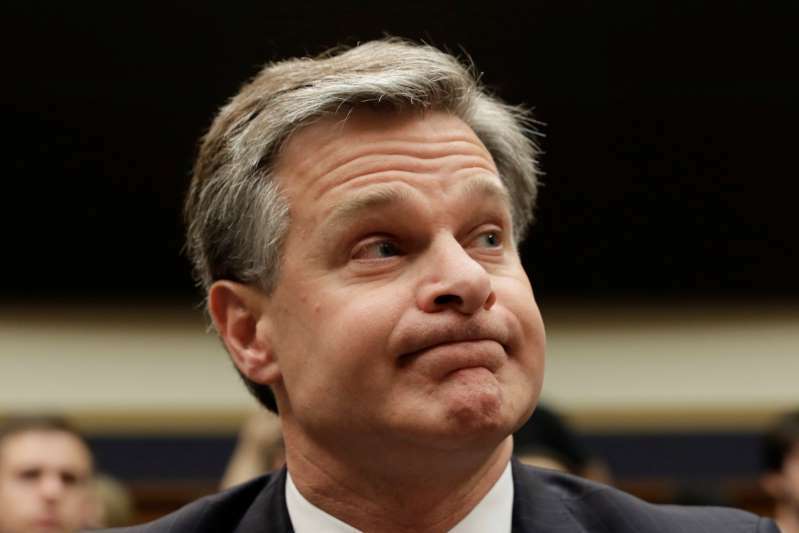 “That’s probably even lower on our list of investigative techniques," Wray said. Putin made the overture on investigations to President Donald Trump at their summit in Helsinki on Monday, and Trump praised it as an “incredible” offer. White House Press Secretary Sarah Huckabee Sanders said Wednesday that Trump has entertained Putin’s request to let Russian authorities pose questions for the former American ambassador to Moscow, Michael McFaul. In exchange for the opportunity to have McFaul and a number of other Americans questioned, the Russian president offered to let Special Counsel Robert Mueller observe interrogations of 12 Russian intelligence agents indicted by a U.S. grand jury last week for hacking Democratic Party email accounts. In a question-and-answer session moderated by NBC’s Lester Holt, Wray said he doesn’t agree with Trump’s view that Mueller is on a “witch hunt” in his investigation into Russian meddling in the 2016 presidential campaign and whether anyone close to Trump colluded in it. “I think it’s a professional investigation conducted by a man that I’ve known to be a straight shooter,” said Wray, a Justice Department veteran whom Trump appointed director after firing James Comey last year. Asked if he’d threatened to quit his post at any point, Wray said, “I’m a low-key understated guy but that should not be mistaken for what my spine if made of -- so I’ll just leave it at that." Wray also said he stands by the assessment of U.S. intelligence agencies that Russia acted -- and continues to act -- to interfere in American politics. Russia is “by far the most aggressive actor” trying to disrupt U.S. society and continues to engage in “malign influence operations” aimed at sowing discord and divisiveness, he said.